Congratulations! You’ve found the ultimate guide for going solar in British Columbia! Interested in sponsoring the British Columbia Solar Guide? Click here for details. British Columbia is currently ranked the #7 province in the country for installing a solar power system, scoring as one of the best provinces for installation costs and for access to solar power. This page contains all available information about installing solar in BC including solar incentives, regional geography, electrical utilities, and access to solar, as of 2019. We’ve ranked British Columbia as being Canada’s 7th best province for solar power in 2019. British Columbia scores higher than most provinces because it has the second lowest installation costs in the country, a high penetration of high quality installation companies, and several energy incentive and financing programs. Curious to see how and why we rank the provinces the way we do? Check out the Solar Rankings Page to find out more. This section is intended to answer these basic questions before going into the details about installing solar in British Columbia. You’ll need to figure out how much energy you use in a year by adding up the amount shown for 12 consecutive months. Note that taking one month and multiplying by 12 won’t work because energy use fluctuates depending on the season. 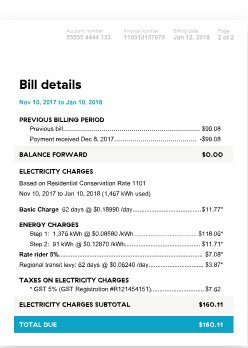 So let’s pretend you added up your hydro bills and determined that you use 10,000kWh over the course of a year, you would then do the above calculation and determine that you need a 9.96kW solar panel system! Now that you know the size of your system, you’ll want to determine the best place to put it. Most residential homeowners in BC put the solar panels on their roof, while most rural homeowners put them on the roof of their house, shop, or on the ground in their yard. The last piece of basic information that you’ll want to know is an approximation of how much your system will cost. To calculate this you’ll need to know the size of the system you plan to install (see previous section). The rough calculation is simple. Just take the size of your system and multiply it by the $2.64/Watt (the average cost of installing a solar system in British Columbia). Using the example from the sizing section, we can see that a 9.96kW system would cost approximately $22,658 to install. Please note that the exact price of the system depends on several factors including the system size, the quality of equipment used, and the complexity of the job. Even the range in the chart above is just for the average – installation prices can easily go as high as $3.30/Watt for premium equipment installed by the highest quality installers. British Columbia has relatively little solar energy rebates at the provincial level, however it does have several energy efficiency and electric vehicle rebate programs. This section briefly covers the energy incentives available to homeowners, a more in-depth explanation of each can be found on the British Columbia Incentives Page. Application. Rebate applications, including all paperwork, should be handled entirely by your installation company. We’ve vetted our installation partners to ensure they are capable of doing this for you. Although BC does not currently have an solar rebates at the provincial level, it is the only province with a PST exemption for all solar panels. The Alternative Energy Sources PST Exemption also covers solar thermal, as well as any necessary equipment needed for installation including wiring, controllers, inverters, pumps, and tubing. The average British Columbia resident can offset their power consumption with a 9.96kW system and save $1,840 on their purchase. Businesses can now use the Federal Tax Provision for Clean Energy Equipment to fully expense their solar system. This means a CCA rate of 100% and the abolishment of the first year rule. Remember, energyhub.org also has a special solar incentive. It’s not huge, but it’s easy to claim – just send us a picture of your installation or purchase agreement with one of our certified energy installers. Full details on the energyhub.org Cash Incentive Page. In terms of available natural resources and homeowner energy demand, British Columbia is on the lower end for provinces in the Canada. This section briefly covers the amount of sunlight that BC receives (solar irradiation) as well as energy demand from homeowners. 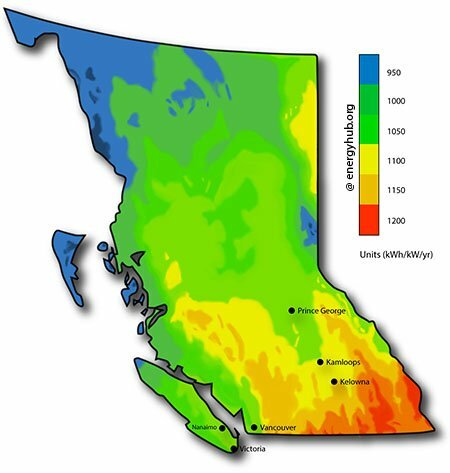 British Columbia has the 11th highest potential to produce solar energy in all of Canada, receiving less solar irradiation most other provinces and territories except for Newfoundland and Labrador and the Yukon Territories. According to data from National Resources Canada, the average solar system in British Columbia can produce 1004kWh of electricity per kW of solar panels per year. The average household in British Columbia uses 118GJ of energy per year – that’s the equivalent of 22,200 kWh of electricity! And although most homes only use about a third of that (because of gas heating), the number still demonstrates a reasonable need for energy generation and energy efficiency technologies. In sum, at least for the average homeowner, it is completely possible to offset one’s yearly hydro bill with a solar system system. British Columbia is one of the best provinces in the country to switch to solar power in terms of utility related factors. This section covers how the costs of electricity as well as solar setup fees affect of the feasibility of solar in BC. Variable electricity rates determine the maximal amount of money that can be saved by switching to solar – ie. they represent the portion of your hydro bill that goes to zero when you don’t use any energy. Thus the relatively low rates in BC ($0.09/Watt) means that the average homeowner will save only a moderate amount of money. On the other hand, fixed electricity costs are not so good because they don’t disappear even if you switch to solar power – you’ll pay them as long as you remain connected to the grid. However, this isn’t necessarily a bad thing – $11/mo is a small price to pay for using the grid as your energy back-up and virtual energy storage device (and much lower than most other provinces). The only way to completely remove your fixed costs are to go off the grid, something most homeowners don’t do due to the large price and maintenance costs of battery storage. Plus, disconnecting from the grid means you won’t be able to participate in a net metering program. Net Metering is one of the most important policy mechanisms that makes solar a feasible energy generation option. Net Metering essentially means that you can send the excess energy that you produce (during the day and summer) back to the electricity grid and earn credits for that energy at the same retail rate that you buy it for. These credits can then be used to offset your energy usage during times when your solar system doesn’t produce as much energy as is needed (during the night and winter). Without this mechanism, you would need to purchase an extremely costly set of batteries. BC’s Net Metering Policies allow for systems up to 100kW in size to be connected to the grid for net metering, however it’s very important to note that credits in BC expire yearly, thus you’ll want to work closely with your installer to make sure your system perfectly matches your energy usage. BC’s currently policies also ensure that you don’t need to pay for an interconnection study or a bi-directional meter when you switch to solar power. This is opposed to many provinces like New Brunswick and Nova Scotia where interconnection and bi-directional meter fees exceed $500! A completely new section to this year’s British Columbia solar guide, Access to Solar explores the major accessibility factors in the province. The upfront cost of installation is obviously one of the largest factors that determines whether or not a person is going to switch to solar. The current prices in BC range from $2.25-$3.35 with the average price being somewhere around $2.64. Remember, you can easily calculate the total estimated cost of your system in the Basics Section at the top of this page. In general, aiming for the cheapest price shouldn’t be your goal. Remember that the energy output on solar equipment is guaranteed for 25 years, so you want to make sure that your installation job is good enough to support that. You’ll also want to be sure that the company you choose will be around in 5 to 10 years from now in case you need service or warranty work done. Property Assessed Clean Energy (PACE) is an innovative financing option that allows you to cover the entire upfront cost of your solar system (or energy efficiency upgrades) with a $0 down, long amortization period, low interest ‘loan’. However, unlike a typical loan, this loan is attached to your property (not you) and is paid back alongside your property tax bill as a Local Improvement Charge (LIC). And while BC does not have a major PACE legislation, there are two communities that currently offer PACE and PACE-like financing. The first is the City of Nelson’s On-Bill Financing Program which allows homeowners to borrow up to $16,000 for home energy upgrades and pay it back through their Nelson Hydro electric bill. Loans are approved based purely on payment history and property verification – no personal income or credit information is needed! The second program is the Penticton Home Energy Loan Program which grants loans up t $10,000 to be paid back through your Penticton Electric Utility bill. However, this is not a true PACE program as the loan is dependent on your personal credit history. Obviously though, PACE is not the only way to finance a solar system. Systems can be financed by cash, bank loans, installer financing, home equity loans, a home equity line of credit, a mortgages (for new builds), or through energy loans. The final category that we ranked for this year’s British Columbia solar guide is the access to reputable and high quality solar installers. And fortunately, BC has no shortage of them. When you request an installation estimate through our contact form, we will connect you with the best installation company based on your specific system needs. British Columbia has a great PST exemption on solar panels, low installation costs, and an abundance of reputable solar companies, however we still rank BC as being the #7 province in the country for switching to solar power. Do you love sustainable energy? Support this project by taking action, sharing this page, or commenting below!